You wouldn’t believe how many calls and emails we get from guys wanting a tool to mortise doors or drill a raceway that won’t break their pocketbook. Well...we have FOUND that Bad Boy !!! 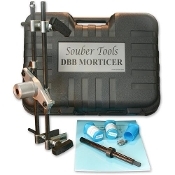 The DBB Morticer by Souber Tools What a Tool !! One tool that does the job of 3 or 4 !! The DBB can Mortise doors to receive FULL Mortise Locks AND Faceplates. Mortise Hinges and Strikes !! Drill raceway for electrical wiring thru 3 foot OR 4 foot wide doors too !! All the installer needs is a power drill (1/2 “ preferred) Various sized bits and plungers available . What a GREAT TOOL !!! We’ve checked it out thoroughly.... It’s tha REAL DEAL !! Durable, Heavy Duty, VERY SIMPLE to use !!! Self Centers and Clamps onto the edge of door. Vertical guides, height and depth stops to ensure you do not overrun the cut. 3 Carbide Tipped WOOD Cutters ( 7/8", 1" and 1-1/4") COST ?? ?....Let’s do some quick math.. Porter Cable Lock Mortiser approx. $1,200. Face Plate attachment for mortising face plate ...$150-$200. Raceway Drilling Tool ( Know of only one)....$600-$700. You’re at about $2,000 with NO hinge mortising system. (You can also mortise HINGES with the DBB .) DBB MORTISER is $450.00 . You get 3 different sized wood cutters. (Like having a Porter Cable Mortiser AND Face Plate Attachment).. DO YOU WORK ON ALUMINUM DOORS MOSTLY ?? YOU CAN ALSO GET THE MORTISER WITH (4) ALUMINUM CUTTERS !! (5/8", 3/4", 1" AND 1-1/4") FOR JUST $495.00. Need to just drill Raceways ? Get the Morticer with Raceway Attachment & 4-foot long drill bit for $575.00 DBB MORTISER (THE WHOLE PACKAGE) is $645.00 With THE WHOLE PACKAGE You get: DBB MORTISER with RACEWAY ATTACHMENT (4-foot long drill bit included !!) & OFF-SET HOUSING ATTACHMENT FOR MORTISING HINGES AND STRIKES and 3 wood Cutters ( 7/8", 1" and 1-1/4") With The Whole Package... Mortise Doors COMPLETE for Full Mortise Locks. Mortise doors to receive hinges without using nails to tack jig to door. Accurately drill RACEWAYS thru 4-foot wide doors to receive electric locks and hinges. Guys charge $250 just to drill ONE raceway in the field. The DBB Morticer Pays for itself extremely quick !! If you're in the field installation business then there is NO way you can ever leave shop without The DBB Morticer. DOORS THICKER THAN 2-1/8" ?? Get the SPECIAL HOUSING ADAPTER (HKS) and mortise doors as thick as 3-3/4" !!! Remember to get JAMM ...the Door Wedge that holds the swinging door in place while you Mortise it ! !